The American Mini Pig Association has a veterinary search tool available. (LINK). 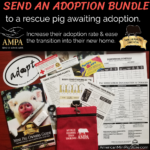 When choosing a veterinarian for your rescue pig you’ll want to do some basic screening/interviewing to make sure it’s a good fit for your rescue organization. What is the price, and what is included in the price? Is a wellness check required before the surgery for an additional office visit fee? Do you accept Care Credit for times of emergency? Do you accept payments over the phone? Sometimes rescue supporters offer to call in donations to help cover veterinary bills. How many mini pigs have you spayed or neutered? What age and/or weight do you prefer to do the surgery? Is there an age or weight limit that you will not spay or neuter? For example, only pigs under 1 year old or up to 60 pounds? What anesthesia do you use, and why? Where do you make the incision? Do you send home pain meds with the patient? In males, do you routinely close the inguinal ring? In males, do you remove the preputial diverticulum or “scent gland” (to minimize the pooling and discharge of foul-smelling preputial fluid)? Do you require vaccines for surgery? How long do you keep the pig in your office after surgery? Do you have a 24/7 number I can call in emergency? What warning signs should I watch for after surgery? What warrants a call or an office visit after surgery? When a pig needs medical attention, how long is the typical wait for an appointment? Do you consult with other veterinarians if you run into situations you aren’t familiar with? Do you perform pig necropsies in case of an unexpected death at the rescue? What is your procedure for tusk trims? Do you anesthetize or sedate? Do you use a gigli wire? What is your procedure for hoof trims? Do you anesthetize or sedate? Do you flip the pig? How do you restrain pigs during office exams, or do you have the owner restrain the pig? Do you offer home visits or house calls for pigs that are unable to travel? What is the cost? How familiar are you with local diseases in pet pigs? Always remember, you have a choice!! If you feel uneasy with a veterinarian for any reason, please seek another opinion. Pigs do feel pain. Some veterinarians have believed that animals don’t require pain meds after surgery. However, they seem to be moving towards a more humane way of treating pain as our understanding of these animals increase. If your veterinarian does not routinely give pain meds ask if he WILL at your request. Even if he doesn’t feel pain meds are necessary, he should at least be sympathetic to your feelings as the client. Pain meds after an invasive surgery is a reasonable request. If he refuses, then find another vet. The veterinarian should listen to you, show compassion towards the pet, and always put the pet’s best interests first. Ask as many questions as you can. The veterinarian and staff should gladly answer all your questions. If they are not willing to discuss with you now, they may be as unwilling when you have a sick pig or emergency case. Visit the office with a pig. Ask for a tour. Pay attention to how you are treated and decide if this is the environment you want to be in when medical attention may save a rescued pig’s life. Cost is certainly an issue with any rescue organization or rescue effort. However, quality care is of the upmost importance. Many veterinarians are not familiar with the care of mini pigs. They may fail to identify a possibly fatal illness or they may inadvertently error during surgery. Do not settle for a veterinarian that you are not comfortable with. Keep searching and find that perfect vet. Isoflourane gas is the safest and most common anesthesia for pigs. If he uses another anesthesia ask why, discuss the risk and benefit of that anesthesia vs Iso gas. If you ever get the feeling the veterinarian doesn’t have time for you, find another vet. If you feel the veterinarian is not willing to accommodate the needs of your pig, find another vet. If you feel the vet doesn’t show compassion for your pig, find another vet. If you feel your vet doesn’t have the knowledge to treat your pig and isn’t willing to reach out to other resources for your pig’s benefit, find another vet. If he doesn’t put the pig under anesthesia for a neuter or doesn’t routinely close the inguinal canal, find another vet. Rescued pigs are counting on you to ensure they get the care they deserve. Be their voice.